Hotel Pushpak Malappuram is a two star hotel that is located in the vicinity of the Calicut Airport and is 30 minute drive from the Calicut city. The hotel which is part of Leena Group was started in the year 1989 and has made a mark for itself through its impeccable hospitality. The hotel which is actually situated in a place called Kondotty is quite famous as it is the birthplace of the great mappila poet, Moyinkutty Vaidyar who is also known as Sulthan of “Ishal Songs” and he has popularized the Mappilapattu and a memorial has also been built for him in Kondotty. The Malappuram district is also quite famous for verdant hills, long sandy beaches, historical places, Padinharekara beach, pilgrimage centres, Angadipuram, Thirumandham Kunnu, Thirunavaya, Trikandiyur and Mumburam. The hotel also arranges for the sightseeing visits and excursions on request. The hotel is ideal for business and leisure traveler. 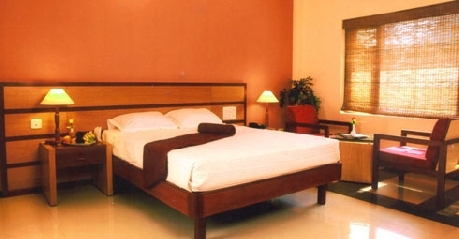 These rooms provide a sense of luxury and comfort and come with state-of-the-art facilities. The amenities available are air conditioner, spacious bathrooms, high-end fittings, television with cable/satellite connection, geyser facility, 24 hour running hot/cold water, parking, doctor on call, twin beds, desk and chair, room service, telephone, daily newspaper, coffee/tea vending machine in the lounge, etc. The spacious, luxurious and comfortable rooms are provided with amenities like spacious bathrooms, air conditioner, high-end fittings, geyser facility, television with cable/satellite connection, 24 hour running hot/cold water, doctor on call, parking, twin beds, room service, desk and chair, telephone, coffee/tea vending machine in the lounge, daily newspaper, etc. 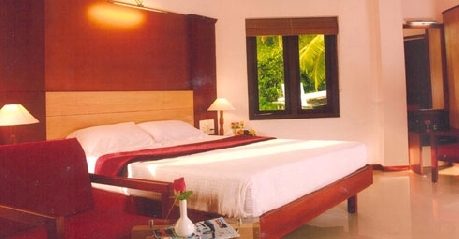 Airy and well lit room that is situated on the second floor are well designed and well furnished. 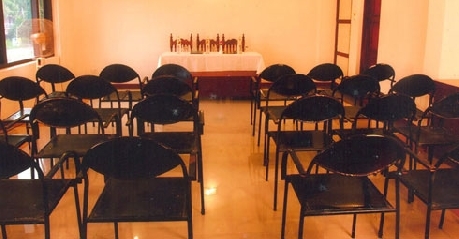 The rooms are provided with amenities like high-end fittings, spacious bathrooms, geyser facility, air conditioner, television with cable/satellite connection, doctor on call, 24 hour running hot/cold water, twin beds, parking, desk and chair, coffee/tea vending machine in the lounge, daily newspaper, telephone, room service, etc. These are worth the money you pay and are ideally occupied by our regular business clients. The rooms come with twin beds, desk and chair, attached bathroom, high-end fittings, geyser facility, television with cable/satellite connection, air conditioner, 24 hour running hot/cold water, doctor on call, parking, coffee/tea vending machine in the lounge, daily newspaper, room service, telephone, etc. If you are travelling in groups of 10 people or as a family then these rooms are ideal with ten beds and two attached bathrooms. The other amenities are desk and chair, high-end fittings, television with cable/satellite connection, geyser facility, air conditioner, doctor on call, 24 hour running hot/cold water, coffee/tea vending machine in the lounge, telephone, room service, daily newspaper, parking, etc. The air-conditioned on-site scrumptious multi-cuisine restaurant serves North Indian, South Indian, Chinese and Continental non veg food. It serves both in house guests as well as outsiders. Parking is also available. The 24 hours coffee shop offers a wide choice of beverages along with the lip smacking snacks to both in-house and outside guests. You can enjoy the stars and moon and also the beautiful view of the city by enjoying delectable South Indian, North Indian, Chinese and Continental Cuisine. 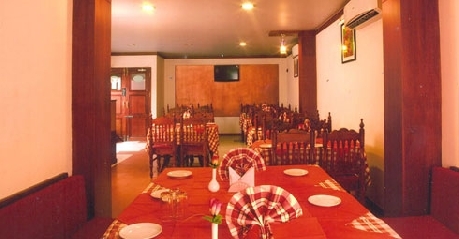 The Restaurant caters to both resident and non-resident guests. Parking is also available. The well stocked bar in the roof garden is the perfect place to unwind with your friends and colleagues at the end of the hectic day.